Battlestar Galactica, Distant Worlds, Panzer Corps and more. Slitherine and Matrix strategy romps don’t shed their price all that often, but this year’s Christmas sale, running until January 13, is a doozy. Around 300 wargames have been reduced, some by 90 percent, allowing you to ignore the impending holidays and, instead, spend all your time fighting wars on hexy maps and in space. Included in the sale is a personal favourite of mine: Distant Worlds - Universe. It’s been reduced by 75 percent, down to £11.24/$15. It launched in 2014, collecting Distant Worlds and all of its expansions, and it’s still one of the best space 4X games out there. Developer Code Force managed to create an absurdly detailed, intimidatingly complex interstellar real-time 4 game that’s also really easy to get into, and it’s all thanks to automation. Every single system, from trade to combat, can be automated, and thank goodness the AI is more than competent. This means you can pick the parts that you like and just play with them, or you can ease yourself into it by starting with just the basics and, bit by bit, start taking control over more systems once you get comfortable. It’s a great way to introduce what is a tough game to really grasp, at first, but there are plenty of reasons to use automation even if you’ve got a good grip on how to run a space empire. I’m partial to starting out by controlling a single ship, exploring the universe Enterprise-style. 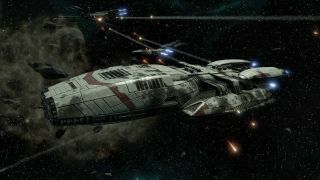 Other sci-fi deals include the extremely tough Battlestar Galactica: Deadlock and planetary 4X game Pandora: First Contact, as well as loads of Warhammer 40,000 games. Out of the grimdark offerings, Armageddon is definitely worth a look. It combines massive Warhammer battles with a Panzer Corps-style hex-based wargame, and it works really well. It’s 70 percent off. The more recent Gladius is pretty interesting, too, pitting a bunch of 40k factions against each other in a 4X war where there's no diplomacy. It's been reduced by 25 percent. On the subject of Panzer Corps, it’s 90 percent off, so you can grab it for measly £1.24/$2. World War 2 grognards are well catered for, with everything from the Close Combat series to Order of Battle going cheap. You can buy them all on the official site or Steam.